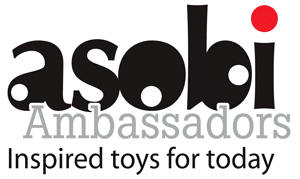 As regular readers will know, this year we’re working with Asobi and its consumer facing brand, Kind Toys, to test some of the brightest and best toys and activities stocked in their range. 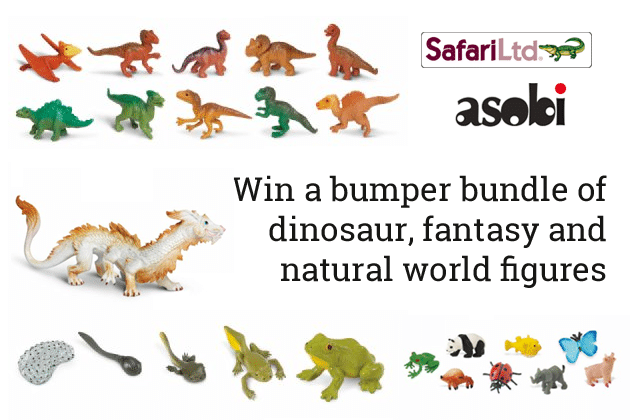 This week, we’ve been trying out a bundle of dinosaur, fantasy and natural world figures by Safari. Read on to learn what we thought of the toys and then grab your chance to win a set just like it for yourself. As a big fan of anything scientific, JD really likes this set as it shows how a tadpole develops into an adult frog (approx 2 inches long) through five stages. The only downside is that the pieces are not to scale in relation to each other, which takes a little explaining, but it definitely helps bring the concept to life. There are lots of other animals in the Safariology Life Cycles series and I think both kids would enjoy playing with them. As possibly the biggest dinosaur fan in the world, JD was delighted with this tube, or ‘TOOB’ of Dino Babies, which includes a Pertadon, Allosaurus, Apatosaurus, Triceratops, Brachiosaurus, Stegosaurus, Parasaurolophus, Velociraptor, T-Rex, and Spinosaurus – all about 1.5-2 inches long. JD was able to name each of them accurately as they came out of the packet – the names are printed on their bellys, otherwise I’d have been none the wiser! The largest item in the set, this 8 inch long dragon has intricately detailed sculpting and painting, making it JD’s favourite item. It’s now on display on the shelf in his room, ready to be ‘flown’ around the room again when the feeling takes him. A great gift to pop in a party bag or stocking, these little packs of miniature animals (less than 1 inch by 1/2 inch in some cases) is great fun. We got a shark, chicken and crab abomg out set of seven minis, but you might get any combination from the whole range. Great for a adding a little irrelevance to any miniature farmyards you might already own – we now have a shark living in the duck pond. Overall, all the little figures are great quality and added something different to our imaginative playtimes. For your chance to win all the items featured above, simple complete the widget below. A 20% discount has been set up on the Kind Toys website for all Safari products when using the code ‘SAFARI’ at the checkout. This will be live throughout July. Disclosure: we were sent the kit for review and Asobi is providing a second kit for giveaway. Fab comp,my sons just discovered dinosaurs so he wants everything dino themed. Thank you! My youngest two love dinosaurs!